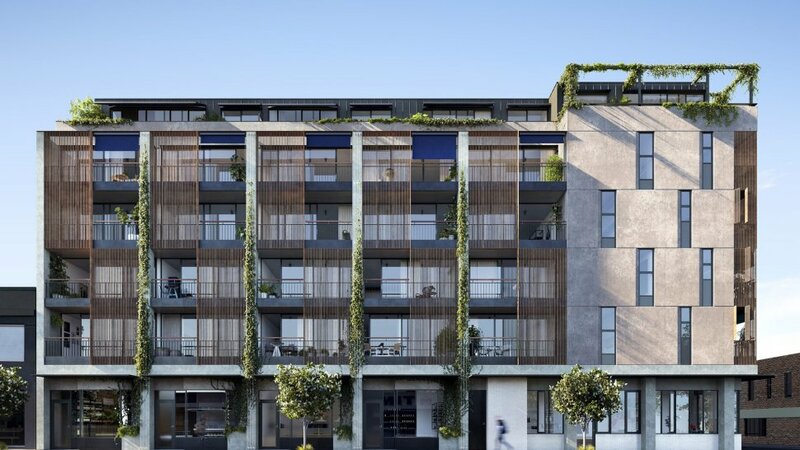 It hasn't materialised yet, but there's more than enough evidence to show that the eastern reaches of Richmond's Swan Street will become one of Melbourne's premier suburban development pockets. The notion has been reinforced by two fresh commercial development applications that not only underpin Swan Street's looming development credentials, but those of City of Yarra's in general. The flight of developers to the municipality seeking to create 'new experience' commercial developments had been well documented of late. Swan street though has yet to see any tangible construction activity, save for Olor Apartments. At 306 Swan Street, Olor with its 31 new apartments over 7 levels is the first salvo in a development push that will likely change the fundamental complexion of Swan Street east of Bridge Road. Characterised by small retail and commercial premises along its flanks, Swan Street has a structure plan in place that will allow for the transition away from an intimate small-scale streetscape to a medium and high-rise outcome, particularly so when heading east toward Burnley Station and surrounds. The developments in waiting are a clear indication that developers consider the area prime for renewal. 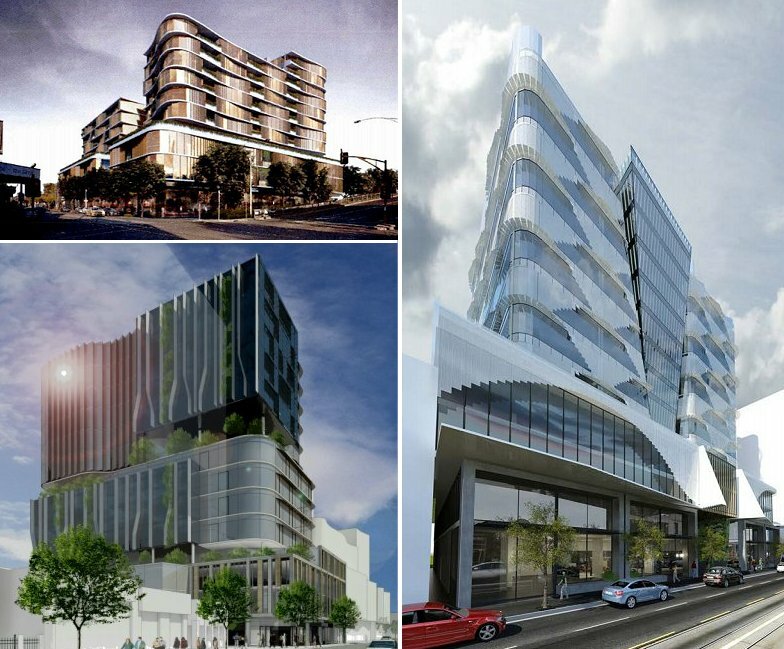 Latest to enter the Urban.com.au project database are a duo of boutique commercial developments. 439-443 Swan Street is a Bruce Henderson Architects-designed complex for Swan Street Property Pty Ltd. 10 levels is sought for the 603 square metre corner site, with a Net Leasable Area of 3,467 square metres. A rooftop terrace and provisions for 54 vehicles and 43 bicycles are rolled into the design. Another 'pocket' development claiming a small development site is 389-393 Swan Street; t-a square architects have conceived a 9 level office complex incorporating 1,548 square metres of Net Leasable Area. Both these projects join 345 Swan Street as being ideal smaller tenants or strata uses based upon site size and floorplate limitations. Highlighting the mixed-use nature of the emerging precinct, a quartet of developments are devoted to apartment and serviced apartment living. Builder Minicon has taken Farmer, Cutter and Swan's 53 apartments to construction whilst Mitpit Constructions has signage up over 314-320 Swan Street. The Ewert Leaf-designed project will add private apartments, commercial office space and a sizeable serviced apartment component to the area. Also looking to add serviced apartments is 291-295 Swan Street which went to planning during June. Next to launch publicly is TWO51. Backed by Blueprint Projects the pending sales campaign will launch 28 luxury apartments in to the marketplace at 251 Swan Street. The balance of projects destined for Swan Street are also the biggest. A permit is in place for the Bruce Henderson Architects-designed 370-374 Swan Street whilst 484-486 Swan Street is still at planning. Both commercial developments could add a combined 28,400 square metres of commercial office space to what is essentially a virgin area in terms of catering for major tenants with new commercial builds. The closest precinct to see such large sized tenants drawn to the area is the Botanicca corporate park in adjacent Burnely. Last cab off the Swan Street rank is 462-482 Swan Street with Bamfa Properties hoping to realise 200 plus apartments within dual buildings designed by Elenberg Fraser. Earlier designs for the site reached 17 levels although the current bid reaches 10 and 12 levels respectively.